Get the official CATHOLICS VS KHAKIS SHIRT to wear on September 1st when ESPN's College Game Day invades Notre Dame for the Michigan game to kick off the 2018 college football season. 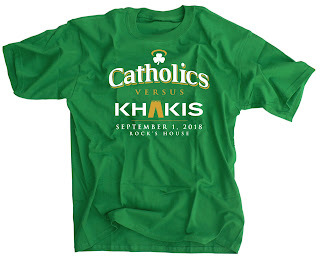 With the decision to encourage the Notre Dame students, alumni, and fans to wear GREEN to make the stadium stand out at night from the typical blue and gold we decided to make an #IrishWearGreen version of the Catholics Vs Khakis Shirt which can be purchased here. Of course if you are not an Irish Green person you can purchase the shirt in the traditional BLUE AND GOLD (Catholics vs Khakis) here.